Sunshine gave way to rain at Spa-Francorchamps on Thursday, as F1 prepares for a typically unpredictable Belgian grand prix. In the notoriously fickle Ardennes region, the sport's figures were surprised as they arrived at the fabled circuit to find a bright and dry paddock. "Good news -- really warm and sunny at Spa," said Virgin Racing on its official Twitter channel. Shortly afterwards, Mercedes GP reported: "Oh wait ... it is now raining." The Telegraph's Tom Cary was more eloquent as he described how the "blue skies and sunshine have given way to thick white cloud and fine mist-like rain". The official forecast is for a probably wet Friday ahead of potential rain for qualifying, with Sunday likely to be better. 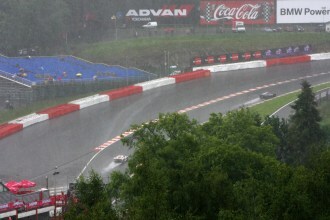 But championship leader Sebastian Vettel said the most predictable forecast is for a weekend "full of surprises". "Spa can be raining one minute and then the sun can be shining the next." Agreed Force India's Adrian Sutil: "We should probably expect some more rain showers this weekend."